ShareSpaces - On Demand Secure Collaboration. ShareMethods has developed the concept of a “ShareSpace®” - a special, independent place or portal where users can distribute content online and easily collaborate with business partners, teammates, or individuals to work together on content and documents. Any user or organization on the Internet can be invited to participate in a ShareSpace. It’s a place for the sharing of content that meets the requirements of secure business transactions. ShareSpaces have the flexibility and agility of invitation-based social networking tools like LinkedIn and Facebook combined with the security and control of enterprise cloud computing platforms like salesforce.com and Google. ShareSpaces blend flexibility and security, delivering content sharing ideally matched to collaboration within, across, and beyond business boundaries. There are really no limits or boundaries to ShareSpaces and their flexibility combined with control makes ShareSpaces unique and powerful. ShareSpace Document Management: Each ShareSpace benefits from all of the document management functionality that comes with ShareMethods, including version control, full text search, analytics, etc. 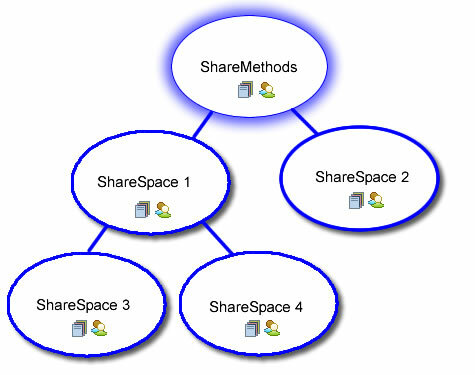 ShareSpace Creation Wizard: There is an easy three step process to set up a new ShareSpace, add documents, and users. Branding: Each ShareSpace can be customized to reflect visual and text branding with look and feel configuration as needed by ShareSpace users. Activity Feed: Each ShareSpace has an activity feed so the team can immediately see each others activities.